Newspapers and commercials may be the topmost things that come to your mind when you hear the word ‘marketing’. Well, the time has changed and so has the audience. Today when people hardly find time to eat their breakfast, expecting them to read the entire newspaper is totally outrageous. These days, when people are tied to their smartphones, computers and enjoying fastest ever Internet at almost free of cost, using newspapers ads and long commercials for marketing is clearly old-school. 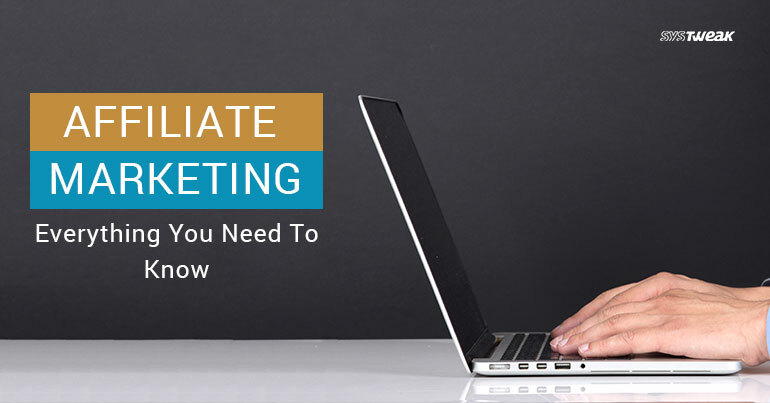 However, if you plan to play along with technology, Affiliate Marketing can be your new money-making mechanism. Affiliate marketing is a performance-based marketing strategy that involves the merchant, the affiliate, the end user and the network. Here, the merchant is the core seller and affiliate is the one who gets commission out of the sales made through its platform. Affiliate Marketing follows the same conventional business method, where a person plays the role of a franchisee and charges commission from the franchise upon sales. To put it simply, Affiliate Marketing is a simple process for a company to sell its products through different people (affiliates), who can market the company’s products and services against a commission. When you visit a website, you see different advertisements all over the page. If you click on them, they lead you to a different website, where you can buy that product from. This process of you being on the affiliate’s website (one with advertisements) and then buying that item from a different website (the merchant), is how the affiliates earn the commission from the merchants. Performance based earning: Affiliate marketing has become the most popular way of earning over Internet. However, this income isn’t constant and promised. The affiliate earns when a buyer successfully places an order by clicking on the advertisement at affiliate’s website. It is another form of third-party business module. Better sales result: Affiliate marketing has become more of a side income mechanism. It is now considered as a full-time job for millions of people having own websites. As a result, affiliates put more efforts to keep and increase their income, which helps merchant to sell more items or services. Cost effective: Print media and TV commercials are not free. If you want to market its product, it costs him an arm and a leg. Moreover, you can’t keep your advertisements regular due to their high prices. However, affiliate marketing comes to your door step at a competitive price. For many channels, you just have to pay when a sale takes place. Increased traffic: When you employ more affiliates, the visitors on those sites would visit your page too. This directly affects the traffic graph for your website. When the traffic increases, the chances of sales increase proportionally. In case a visitor doesn’t buy, he has come across your website and now know about your products. Third-party validation: Affiliates are here to earn something and it happens when a visitor buys something. These days, affiliates have started to master the product specifications and they keep their website content in such a way, where they can solve the doubts of a prospect buyer. This way, the user gets a second opinion about your product as well as a psychological push to buy a verified product. No business hours: Whether you’re a merchant or an affiliate, you don’t have to follow a strict business timing to earn. A user is free to visit any website at any point of time. This sets you free to furnish your other important chores. growtraffic.com: If you’re new to digital marketing, it becomes harder for you to catch up with all the tips and training to bring traffic to your website. However, growtraffic.com might be of some help to you as it claims to fetch a good sum of traffic without spending a penny. The website asks for a blog post about itself on your website against a whopping ten thousand visitors on your page. Although, you need to make sure that the content you’re writing must be genuine. Once you’re done publishing the article about growtraffic.com, show it to them by filling out the form available here and check if the magic happens. Increased SEO ranking: Relevance is the key to success in SEO. Almost all the search engines prefer to rate inbound links for page ranking. This helps the merchant to improve its website’s SEO ranking as the inbound links would be on a relevant page. Unlimited Scope: Unlike any regular job, you’re not bound to stick to just one employer. Affiliate marketing lets you become affiliate for more than one merchant. You can even become a merchant for two competitors dealing in the same field. Free registration with merchants: If you own a website and want to start affiliating for a merchant, you don’t have to invest a sum. Almost every merchant or business allows free registration of affiliates. However, merchant only approves to show its advertisements after verification of the information you’ve provided. If your website contains any illegal or prohibited content, it may go unapproved. Affiliate marketing depends on cookies to work at its best. Remember those passwords you saved on your browsers along with the location? Those are all cookies that you save on the internet. A cookie is a piece of information that your computer saves to cater you according to your likes and dislikes. Your computer is smart enough to judge your interests and browsing habits. When you go on an affiliate’s website, it shows you the relevant advertisements based on the study of your cookies and past searches. No wonder why you see those hotels and flight have different price offers on different websites. If you own a website and want to earn some extra bucks, affiliate marketing is one of the best methods. You can approach different sellers and service providers who offer their products online. Affiliate marketing doesn’t require you to possess a degree, basic knowledge is sufficient. Let’s take the example of Amazon Affiliate. Amazon offers a free signup where you can create your affiliate account and market its products. You can select the product either by the content relevance of your website or the popularity of product. To make it better, Amazon provides you the HTML code which you can paste the code on your website to make the product visible. Once a visitor clicks on that embedded link and buys the product, you get your commission. Just like Amazon, there are millions of merchants to offer their affiliation that you can avail. Although, every merchant has their own policies and commission rates. There are various methods on which merchants opt to pay you. It’s useful to read and understand the policy and requirements of the merchant you’re considering to affiliate for. Now that you’ve got a fair idea about affiliate marketing, you may want to your head around it. If you’re a newbie, you can watch some tutorial videos to have a better understanding of WordPress and website handling. Once you know how and where to put the advertisement code, you can start working to improve the traffic on your website.